E-mail from B. J. Culpepper, 4 Dec 2002. Lake Park, Lowndes Co., GA, Vol 69, ED 134. Golie Culpepper, Dau-in-law, F, 15, M, GA/GA/GA. Minnie Pratt, Daughter, F, 20, md@17, GA/GA/GA, Clerk/Restaurant. Horace E Culpepper and Tommy Lou Culpepper divorced in 1940 in Manatee Co., Florida. India Anna Culpepper, Sarasota Co., FL, Female, White, Vol 1623, Cert 28783, died 1953. Horace E Culpepper and Jean Irene Culpepper divorced in Apr 1959 in Hardee Co., Florida. Obituary of Pauline I. (Culpepper) Horton, published 16 Sep 1998. Dorace F. Culpepper, Cert 92893, Polk Co., FL, White, 25 Jun 1914 - 08 Aug 1994. Dorace F Culpepper, White, Single, born 1914 in Georgia, residing in Duval Co., Florida, enlisted as a Private in the US Army on 1 Jan 1942 at Camp Blanding, Florida. Rossie James Culpepper, Cert 49408, Polk Co., FL, White, 10 Oct 1917 - 26 Apr 1994. E-mail written June 2008 to Warren Culpepper from Suzanne Evelyn Culpepper (#59009), e-mail address. Benjamin F. Culpepper, Son, M, Dec 1899, 5/12, S, GA/GA/GA. Benjamin F. Culpepper Jr., Son, M, 11/12, Sng, GA/GA/GA. B. F. Culpepper and Maude Louise Pearson on 13 Aug 1921 in Lowndes Co., GA, Book H-412. Nancy Culpepper, Wife, F, Jan 1878, 22, Md 0, Ch 0/0, GA/GA/GA. + St. Joseph Culpepper, 26 Oct 1908 - 3 May 1987. Joseph Culpepper, Son, M, 1, S, GA/FL/FL. Ruby Culpepper, Dau, F, 1, S, GA/GA/FL. Cubie Culpepper, Daughter, 13, GA, GA, GA? Frank Mikel, Boarder, 18, FL, FL, FL, Farm laborer. Mrs. I. F. Culpepper, d. 30 Jan 1940 at 63 years in Echols Co., GA.
Charlie A. Culpepper, Private (US Army), M, Wh, 19, sng, GA/GA/GA, Farmer. Charlie Culpepper and Wilma Padgett on 24 Dec 1922 in Echols Co., GA, Book 1-325. Frank Culpepper, Son, 3 4/12, GA, GA, GA.
Charlie A. Culpepper, d. 27 Jan 1968 at 67 years in Lowndes Co., GA; Res. in Lowndes Co., GA.
at the home of Ida Mae Culpepper Kinsey. Her young daughter had just passed away of leukemia, and her six sisters gathered to offer her support. Eva Culpepper and Eugene Curtis (sic) on 10 Sep 1919 in Echols Co., GA, Book 1-274 (Married the same day as her sister, Anna May)(Also note that while Eugene in named Eugene Curtis in this record, he appears in the 1910 and 1920 censuses in Echols County as "Eugene Carter" and that is also his name in his Echols Co. death record of 28 Jun 1923. The 1919 Marriage record was transcribed from microfilm and probably was transcribed incorrectly.). Eugene Carter, died 28 Jun 1923 in Echols Co., GA, Certificate: 19995-E. Biography 1999� In 1999, grandson David A. Kent wrote: "Upon the death of her husband in 1976, Annie chose to reside with her daughter, Ann Ruth, in Valdosta, GA, and assist in the raising of her granddaughter, Julie. While her physical activity is limited, at 95, our beloved "Grannie Annie" is still of sharp mind and continues to amaze us with her memories." VALDOSTA -- Annie Culpepper Kent, 100, longtime resident of Valdosta, died on Saturday, Jan. 31, 2004 at her home. Born on Dec. 8, 1903 in Echols County, she was the daughter of the late Rev. Isaac Franklin and Nan Browning Culpepper. Mrs. Kent was a member of Forrest Street Church of God and was a homemaker who enjoyed working in her flower garden. 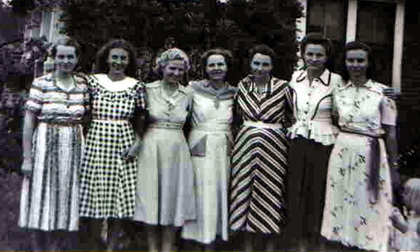 Survivors include her two daughters, Katherine I. Dayton Cowart of Valdosta and Anne K. Smith of Valdosta; two sons and their wives, Louis A. and Carolyn Shaw Kent of Valdosta and Edward and June Goddard Kent of Lake Park; grandchildren, Kay Gross of Valdosta; Don and Diane Dayton of Atlanta; Julie and Padon Hurst of Valdosta; Cindy and Richard Starr of LaGrange; David and Joanne Kent of Richmond Hill, Ed and Penne Kent of Lake Park, Gregory and Ollie Kent of Washington, D.C., Sandra Morris of Lake Worth, Fla., Jackie and Jim Traut of Burnsville, N.C., JoAnne and Jake Jacoby of Jupiter, Fla; 21 great grandchildren and three great-great grandchildren; two sisters, Cordie Register of Lake Park and Rubye Cobett of Valdosta and numerous nieces and nephews. She was preceded in death by her husband, Warren J. Kent, two sons, Herman Kent and T.J. Kent, one grandson, one great grandson, three brothers and four sisters. Obituary of Annie Culpepper Kent, published Sunday, Feb. 1, 2004. Anna May Culpepper and Warren J. Kent on 10 Sep 1919 in Echols Co., GA, Book 1-275 (Married the same day as her sister, Eva). Johnnie W. Culpepper, d. 11 Jul 1991 at 85 years in Lowndes Co., GA; Res. in Echols Co., GA.
Ruby Culpepper, Head, M, 20, md@19, GA/GA/GA. Joseph Culpepper and Jessie Mae Culpepper divorced in 1937 in Palm Beach Co., Florida. Joseph Culpepper and Miss Jessie Mae Sandlin on 20 Feb 1937 in Echols Co., GA, Book 2-86. Saint Joseph Culpepper and Virginia H Culpepper divorced in 1945 in Palm Beach Co., Florida. E-mail written Jan 2009 to Culpepper Connections from Frank Roberts e-mail, e-mail address. Ida Mae Culpepper and G. D. Kinsey on 19 Mar 1932 in Lowndes Co., GA, Book J-144. Cuba Culpepper (Miss) and Tillman Henderson on 4 Nov 1933 in Echols Co., GA, Book 2-43. 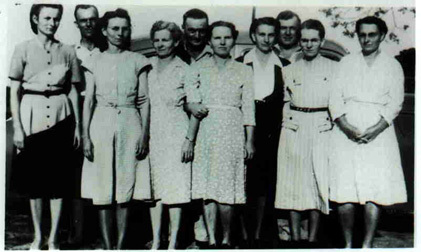 Ruby Evelyn Culpepper (Miss) and Francis L. Corbett on 5 Jul 1936 in Echols Co., GA, Book 2-77. Eugenia M. Culpepper, Wife, 60, md @ 32, GA, GA, GA.
J. W. Culpepper and Miss Eugenia Clayton on 1 Mar 1903 in Echols Co., GA, Book 1-71. Ancestry.com. Georgia, Death Index, 1919-1998 [database on-line]. Provo, UT, USA: Ancestry.com Operations Inc, 2001. Esther E. Culpepper, Dau, F, 6/12, S, GA/FL/GA. E. E. Culpepper, Dau, F, 10, S, GA/FL/GA. Eugenia C. Culpepper, d. 1 Nov 1946 at 77 years in Echols Co., GA; Res. in Echols Co., GA.
Alice Culpepper and Roy Padgett on 14 Sep 1921 in Echols Co., GA, Book 1-304. James W. Culpepper, d. 11 Nov 1948 at 70 years in Echols Co., GA; Res. in Echols Co., GA.
Roy J. Padgett died 28 Oct 1974 at 70 years in Echols Co., GA; Residence in Echols Co., GA.
Who’s Who in the South & Southwest, 13th Ed., 1973 - 1974, Chicago, Illinois: Marquis-Who's Who, 1973, Repository: LDS Family History Library - Salt Lake City, Call No. US/CAN 973 D36ws 13 ed. James E. Culpepper, Boarder (Brother-in-law), 23, Single, GA, FL, GA, Public School Teacher. "Who's Who in the South and Southwest". 13th edition, 1973-1974. Wilmette, IL: Marquis Who's Who, 1973:. James Ewell Culpepper and Cuba Loraine Kinsey on 28 Feb 1934 in Echols Co., GA, Book 2-48. Cuba K. Culpepper, d. 22 Mar 1971 at 55 years in Echols Co., GA; Res. in Echols Co., GA, 008957. James E. Culpepper, d. 27 Mar 1983 at 77 years in Echols Co., GA; Res. in Echols Co., GA.
Ester Culpepper (Miss) and Eugene Blair on 14 Dec 1926 in Echols Co., GA, Book 1-380. Glenn O. Clayton, Step-Son, M, 10, S, GA/GA/GA. Funeral home obituary of Jesse Efford Culpepper. Tavie C. Culpepper, d. 5 Oct 1928 in Lowndes Co., GA, # 27337-J. Nellie Culpepper (age 21) and Herbert Partin (age 22), 9 Jul 1932. 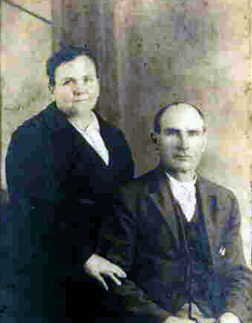 Beatrice Culpepper (age 21) and Willie McLeod (age 22), 25 Jun 1932. Mabel I. Culpepper, Daughter, 2, GA, GA, GA.
Arthur Culpepper and Galie Westberry on 25 May 1919 in Lowndes Co., GA, Book H-185. Goldie E. Culpepper, d. 25 Nov 1952 at 48 years in Lowndes Co., GA; Res. in Echols Co., GA.
E-mail written 2000 to Lew Griffin from Betty Hendrick. Elizabeth Gideons, 52, F, SC. Culpeper, Dau, S, Female, W, 1M, GA/GA/GA. Alice Culpepper and G. H. Shelfer on 22 Jan 1891 in Thomas Co., GA.
John M. Culpepper, Father, M, Mar 1849 (51), Wid, GA/GA/GA. E-mail written 1999 to Lew Griffin from Kathy White Blount (granddaughter of Bessie Alma Culpepper White), e-mail address.